Homicide detectives J.W. Ragsdale and Tyrone Walker are back…investigating what appears to be a simple home invasion robbery gone fatally wrong. The clues lead them to an autistic teenager, an aspiring gang member, who talks to the ghosts of Martin Luthor King Jr. and singer Ricky Nelson for guidance. The troubled, homicidal teen has fallen into the thrall of cowboy preacher Jimbo Reynolds, a slick, bible-thumping, Stetson-wearing conman who has based his cash-cow ministry on ideals plundered from John Wayne movies. What Jimbo doesn’t know is that he’s the target of a gang of misguided ex-cons, led by a psychopathic Native American, who are plotting to take all of his cash…with the help of his greedy publicist and his conniving housekeeper. All of these colorful characters collide in a fateful day of darkly funny, brutal mayhem that’s pure Memphis Luck. This black comedy catches fire as Ragsdale and Tyrone zero in on the ex-cons en route to the mayhem-filled climax. Fans of laid-back mysteries with a strong regional flavor will be rewarded. Brilliantly convoluted, wholly satisfying. 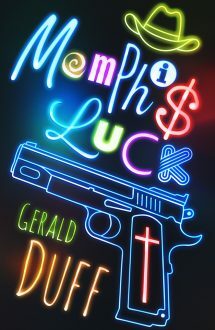 Pretentions are skewered while Memphis is celebrated in the wry, wicked and completely winning 'Memphis Luck.' Gerald Duff has proven himself a Southern treasure. This book is really a sly skewering of the racial, social and religious constructions of the American South disguised as a detective novel. The best thing about Memphis Luck is the dialogue. The dialogue! Ragsdale and Walker are like George and Gracie, Ralph and Alice, Lorelai and Rory Gilmore. The dialogue between these two is intricate and seamless. The Fred Astaire and Ginger Rogers of conversation. A sprawling thriller. Duff is an immensely gifted writer.